Tax season is a busy time. As the workload of every accountant increases, business becomes more hectic, and everything can fall apart without an efficient system in place. Even when you’re working extra hours, you still might fall into the trap of doing way too much admin work to be active with client duties. Managing appointments is one of those activities that will potentially take up your valuable time. This is time that you could be spending working with clients and growing your business. Appointment scheduling usually involves a lot of back-and-forth emails or calls with the client. Especially when it’s tax season, and you also need to determine the exact type of tax service that they want, scheduling an appointment with the client can take up too much of your time. Imagine if you could delegate this work to an automated system and not have to worry about it ever again! Fortunately, that’s possible. An online scheduling system allows the clients to select the type of services they need. They choose the tax preparer that they want to meet with and then find the available time slot which works best for them. That requires no effort from you while putting the power and convenience in the hands of your client. The best part about having this type of scheduling system is that it is centralized. Your employees and colleagues won’t have to keep tabs on appointments separately anymore. Instead, it will all be part of one system that’s accessible to any person who’s granted access. 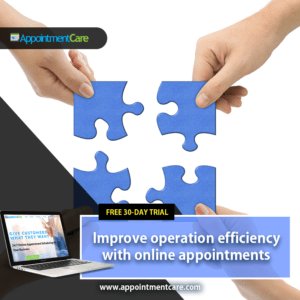 AppointmentCare system makes it possible for the employees to accept overlapping appointments, and even work from multiple locations if that is how you operate your business. It makes team management much easier because you can see everything at a glance. If there’s a busy day looming ahead as is often the case during tax season, you can adjust and delegate the work to more people than you usually would. On days when business is especially bustling, you could use an excellent automated scheduling system to take some of the workloads off of you and your employees. Customers usually prefer scheduling online as opposed to using the phone, because it gives them more control over the schedule. What’s more, an online scheduling system allows you to manage your employees and workload better. With it, you have all the scheduling data within a centralized system that has plenty of nifty features. Such as overlapping appointments, automatic reminders, staff calendars, customer management and many more. Ready to Start Online Scheduling Your Appointments? 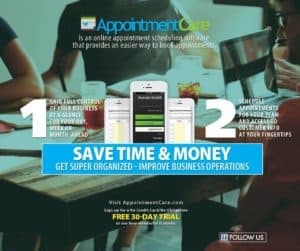 If you like what you see about AppointmentCare, don’t hesitate to try it out. We offer a 30-day free trial of our appointment scheduling tool, all with the goal of helping you determine whether it’s a good product for your business.